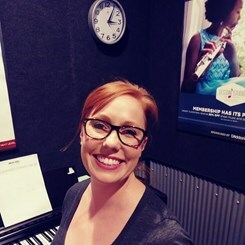 Jordan has taught piano to students of all ages for over 9 years. After studying abroad at the University of Paris, Paris, France and AIMS in Graz, Graz, Austria, she earned her Master of Music degree from the University of North Carolina School of the Arts. She has served as Musical pianist ot the Topeka Civic Theater, Choral pianist and Assisant Director, Shawnee Heights USD 450 and currently serves as accompainist for the BVlue Valley School District. She loves taking students from where they are, with personal interests, and growing them to mature musicians.